A baby girl whose twin failed to develop properly and fused to her growing body in the womb is recovering after a successful operation in the US. 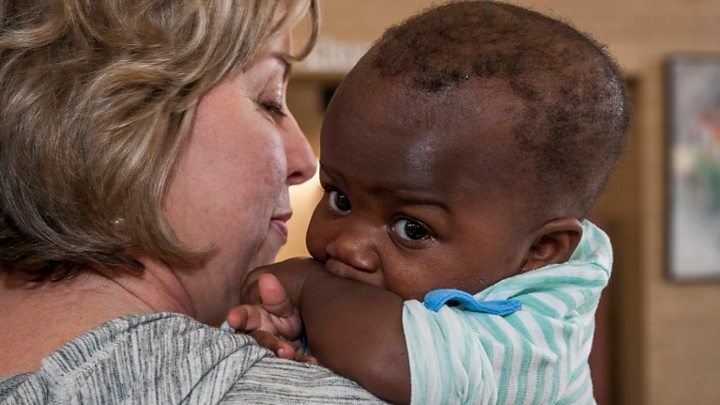 A team of five surgeons at Advocate Children's Hospital in Chicago removed baby Dominique's parasitic twin. In this extremely rare case, her parasitic twin was attached to her back and shoulder. This made her look like she had two extra legs and feet. Dominique travelled from Ivory Coast for the operation and will return soon. Dr John Ruge, who led the surgery, said one of the biggest challenges had been to ensure Dominique was not left paralysed. He said: "There was a lot of challenges to her skeletal system... we could destabilise her spine and cause her impairment." Another of the surgeons, Frank Vicari, said: "We had an enormous amount of imaging, specialised imaging that would allow us to identify her own native anatomy, the anatomy of the parasitic twin and anticipate the problems we might see... so that we could pre-plan what we intended to do and minimise any opportunity for a surprise during surgery." Dr Ruge said the operation had been vital because of the strain on Dominique's heart and lungs of having to "provide nourishment to another almost individual". Also, the parasitic twin had been attached at a very important junction between the neck and the thoracic spine and "that amount of mass and disturbance in that area would cause her significant spinal problems as she grew". Dominique's foster carer in Chicago Nancy Swabb said: "She has touched our hearts. She is a member of our family. "We know that she will go back to her loving family, and we'll keep in touch - but this has changed our lives. She is pretty amazing."